Sen. Kelli Stargel made her statements during the debate on gun proposals Saturday. 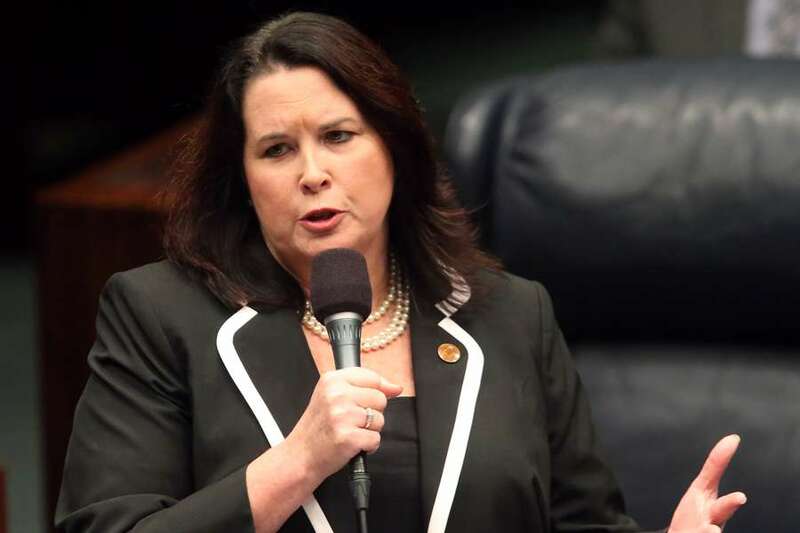 “Thoughts and prayers” are the only thing that could stop the evil behind mass shootings, according to Florida state Sen. Kelli Stargel. At a Saturday debate on a proposed assault weapons ban in the Florida legislature, Stargel said “it’s not the weapon, it’s the evil from within” that leads people to commit deadly crimes. “When we say ‘thoughts and prayers,’ it’s frowned upon. And I take real offense at that because thoughts and prayers are really the only thing that’s gonna stop the evil from within the individual who is taking up their arms to do this kind of a massacre,” Stargel said. Stargel’s remarks come about three weeks after a school shooting at Marjory Stoneman Douglas high school in Parkland that left 17 people dead. Since the shooting, a convoy of Parkland students and parents, along with hundreds of parents and activists from across the state, descended on Tallahassee to lobby legislators on gun control, particularly banning assault rifles. But Stargel seems unlikely to budge. “But are we going to ban fertilizer, which is what they used in the Oklahoma bombing?” Stargel said. “Are we going to ban pressure cookers, which is what they used in the Boston massacre? Are we going to ban the multiple handguns that were used in other assaults? Are we going to ban the sawed-off shotgun as what was used in Columbine?” she asked. On Feb. 14, confessed gunman Nikolas Cruz, 19, a former student at the school, fired rounds of ammunition from an AR-15 semi-automatic rifle into seven classrooms. Cruz was able to purchase the military-style weapon legally in Florida, whose laws allow 18-year-olds to purchase semi-automatic rifles. Current federal law mandates that you have to be at least 21 to purchase a handgun. In a 7-6 vote last Monday, the Senate Rules Committee voted against an amendment that would ban assault rifles and instead sided with the NRA. In a rare weekend session Saturday, the Florida Senate moved forward with a plan to arm teachers, narrowly rejecting the assault weapons ban. The vote was 21-17. Stargel said she aims to craft a detailed gun control plan that would include tighter background checks, raising the minimum age from 18 to 21 and implementing mental health checks.